So a friend of mine gave me an LED Belt Buckle. It was always an intention of mine to WiFi enable it so that maybe people could send a message to it and it would display that message. I decided to instead have it display Tweets where it can display tweets of a particular search term, which still allows people to send it a custom message, albeit through Twitter. 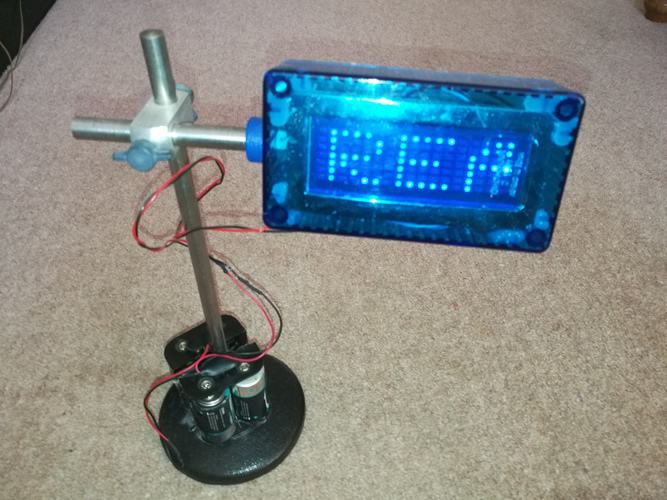 Since its WiFi and gets its power from batteries it makes a nice stand alone Twitter message display system, or even a small unit that can be used for events, performances and exhibitions providing audience interaction. The circuit is built using an ESP8266-01 WiFi module. These are very inexpensive and can be programmed using the Arduino IDE. The ESP-01 is the smallest and cheapest of the ESP range and only has minimal input and output options. Luckily we only require two outputs to control the buttons on the Belt Buckle so it will service for this project. The Digital Outputs simply go LOW to simulate a press of the two program buttons which are ENTER and PID on my Buckle. Using these buttons manually to program in messages takes a lot of time since each letter of the alphabet has to be scrolled through one by one however when programming using the ESP, messages can be entered much faster and more importantly automatically. The ESP chips contain a Web Server and Access Point so it can both make Web requests and act as an Access Point to allow configuration via WiFi. The Access Point Name and Password are pre programmed into the device. 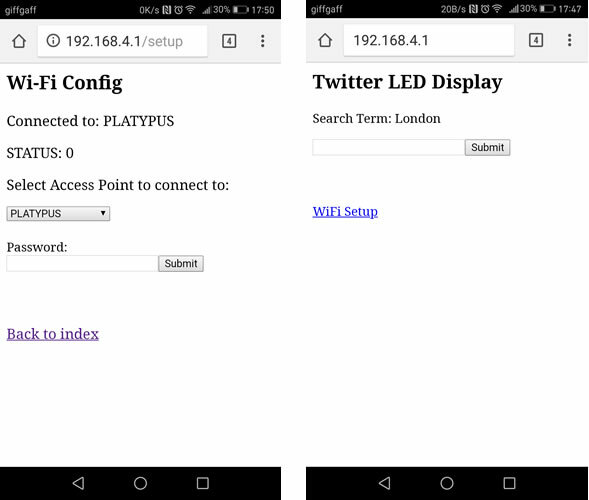 When you connect you need to browse to its IP Address and you will then be shown a Configuration Page where you enter in the Twitter Search Term. This can be your Twitter account @name which will result in Tweets directed at you to be displayed or it can be a trending topic or hashtag. Since the unit is designed to be portable it made sense to include a configuration page where you enter the WiFi Internet Settings. You can then change these easily when you move it to other locations. There are many versions of these buckles and while most work in a similar way they often have different character sets and programming patterns, thus my code may not be transferable to other buckles. Unfortunately my Belt Buckle did not have an @ symbol and since its only four characters wide it makes reading messages a little awkward. It is however a cheap and fun project to make since it made use of items I already had. It forms the backbone of an enhanced device that could utilise a larger LED Display. It also gave me valuable experience using these very cheap, small and versatile ESP WiFi units. The circuit consists of the WiFi module, the Belt Buckle and a variable voltage regulator module. 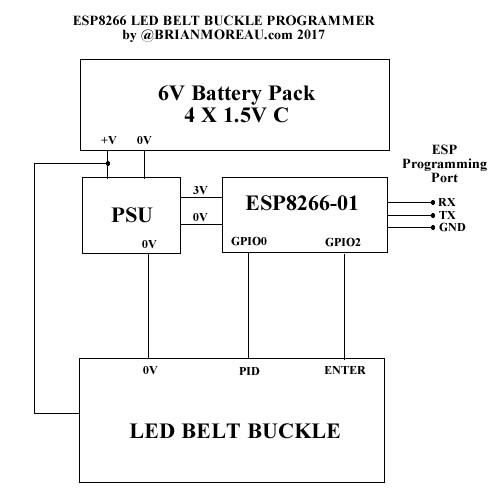 Since the Belt Buckle was originally powered by two 3V Coin Cells it required a 6V Supply which is fed direct from the batteries. 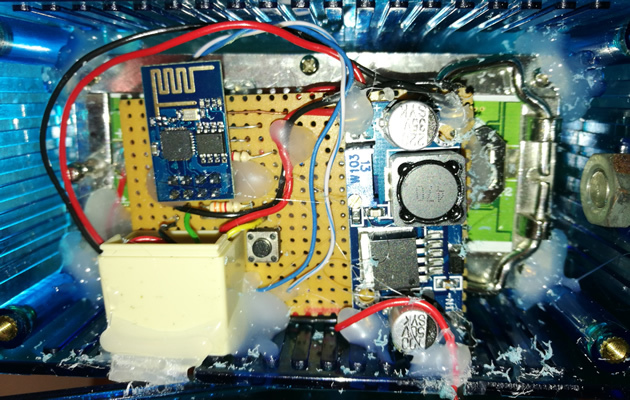 A variable voltage regulator module was used to step down the 6V to 3.3V for the ESP. The ESP draws about 800mA so C Cells were used to ensure the unit could run for many hours on a full charge. My Belt Buckle program buttons simply shorted the program input pins to 0V so by directly connecting a single wire to one side of each of the two buttons and taking this line LOW simulates a button press as all circuits use a common GND. Foreseeing the requirement to modify the ESP program I decided to make it possible to connect a programming lead. This was achieved by splitting in half a Telephone lead joining connector. This produces two sockets, one is used to connect to the ESP Program pins and the other half has three wires that connect it to my USB ESP-01 Programmer. I can then simply program it by connecting a standard telephone lead between programmer and unit. The programs consist of two parts, the Arduino Code which is uploaded to the ESP8266 and the Server Code that is placed on a web server. You will obviously need some webspace where you can upload the PHP script. This script or webpage is accessed by the ESP with a simple web request. The script then connects to the Twitter API to retrieve the Tweets. You will thus also require a Twitter App API Key. This method is required since the Twitter API requires authentication by oAuth and the ESP-01 is unable to make web connections of this type directly. The PHP code thus conducts these calls when requested to do so and then passes the Tweet back to the ESP. I won’t go into how to program the ESP units as this information can already be found from a number of sources on the web. All I will say is they can be a little awkward and temperamental since they do not have an onboard USB program port. I should add that the server script dose not check for any kind of authentication from the ESP device and thus if the URL was known to others then they could use it to get Tweets themselves from any device they choose. This could result in you hitting Twitter API request limits. You don’t need to register to leave a comment because I feel people should not be forced to register to have their say. All comments are checked prior to publishing to prevent spam. Don’t worry this wont take long. If you supply your email address below you will automatically be notified when I approve your comment.